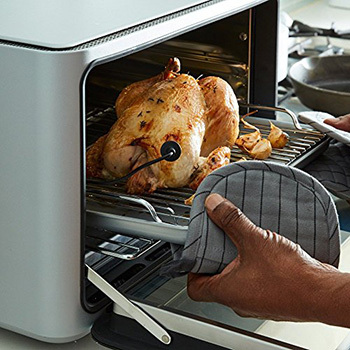 The June Intelligent Oven is a countertop oven about the size of a small microwave that you control with your phone. (Here’s a picture of the app, along with a few other pics.) It lets you watch live video of your food cooking, which traditionally was only available by looking through the front of your oven, which is supposedly inconvenient. The main use-case seems to be steak, which is something you could accomplish on a stovetop burner, grill, normal oven, bath of water, or literally anything that gets hot. You can even cook a steak by wrapping it in foil and leaving it on the engine block of your car while you drive, as this book of car-engine recipes points out. But your car, which you already own, won’t make them an absurd amount of money when you buy it.